Simply enter your name and email address below and I'll immediately send you a FREE sample Turbulence Training Workout and Online Exercise Demonstration Video PLUS my controversial, industry-changing report about why slow, boring cardio is sabotaging your fat loss effort. 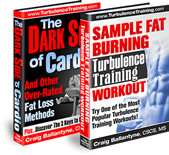 You'll also receive FREE access to my Turbulence Training Inner Circle emails where I'll give you more fat loss secrets on how to burn belly fat and boost your lean mass metabolism. All these gifts are yours FREE as a Thank You for visiting Turbulence Training.